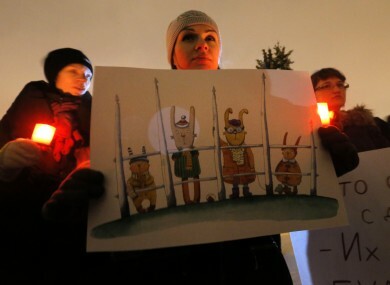 Opposition activists protest against a bill banning US adoptions of Russian children in St.Petersburg, Russia. RUSSIAN PRESIDENT VLADIMIR Putin said today he will sign a controversial bill banning Americans from adopting Russian children, a defiant move against the US that has angered some Russians who argue it victimises children to make a political point. The law would block dozens of Russian children expected to be adopted by American families from leaving the country and cut off one of the main international routes for Russian children to leave often dismal orphanages. Russia is the single biggest source of adopted children in the US, with more than 60,000 Russian children being taken in by Americans over the past two decades. The bill is retaliation for an American law that calls for sanctions against Russians deemed to be human rights violators and part of an increasingly confrontational stance by the Kremlin against the west. Putin said US authorities routinely let Americans suspected of violence toward Russian adoptees go unpunished — a clear reference to Dima Yakovlev, a Russian toddler for whom the bill is named. The child was adopted by Americans and then died in 2008 after his father left him in a car in broiling heat for hours. The father was found not guilty of involuntary manslaughter. Putin indicated that he would endorse the measure. “I still don’t see any reasons why I should not sign it,” he told a televised meeting. He went on to say that he “intends” to sign it. UNICEF estimates that there are about 740,000 children without parental custody in Russia, while only 18,000 Russians are now waiting to adopt a child. The US State Department says it regrets the Russian Parliament’s decision to pass the bill, saying it would prevent many children from growing up in families. Children rights ombudsman Pavel Astakhov on Wednesday said that 46 children who were about to be adopted in the United States would remain in Russia in case the bill comes into effect. On Thursday, he petitioned the president to extend the ban to other countries. Email “Putin says he will sign anti-US adoptions bill ”. Feedback on “Putin says he will sign anti-US adoptions bill ”.